Yep thats Trashmore (RIP) somewhere beneath Henry! Been dying to get Henry G in the archive…thanks for the pic Derek! 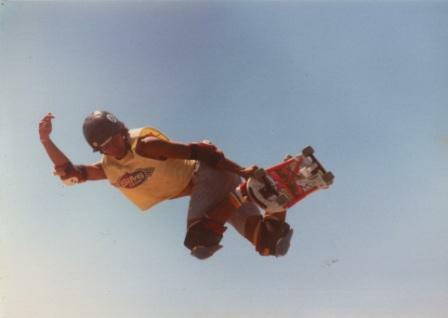 This entry was posted in 1986, Henry Gutierrez, SKATE PARKS:, SPOTS:, Trashmore and tagged ART, backyard ramps, boards, east coast, Henry Gutierrez, jason, Jason oliva, jasonoliva, New Jersey, New York City, oliva, paintings, photography, pool Skating, ramp, ride, sk8, sk8t, skate, skate decks, skate history, skate photography, Skate ramps, skate trucks, skate wheels, skateboarding, skateboarding history, skateboarding photography, skateboards, skatepark, skater, SKATERS, steam, Street Skating, TEAM STEAM, The Barn, The House of Steam, thos, Trashmore, va, vert, vert ramps, Vert Skating on June 7, 2007 by jasonoliva.